Our Marine Rescue Team is made up entirely of volunteers who dedicate considerable time and effort to being well trained and equipped to perform our rescue missions when called upon. From shoreline searches to missing persons in the water our vessel is equipped and crewed to provide the best possible outcome. Our specially trained technicians are instructed on how to operate our marine craft within coastal and inland waters via Transport Canada Commercial SVOP course for vessels less than 5 tonnes. Furthermore, all of our marine rescue technicians are Transport Canada Marine Med A3 certified for additional safety when acting as deck hands or support crew on the boats. Our marine group operates to support our Swiftwater team members as required. The rescue technicians must be able to safely navigate the waterways and transport our search team members and subjects safely. 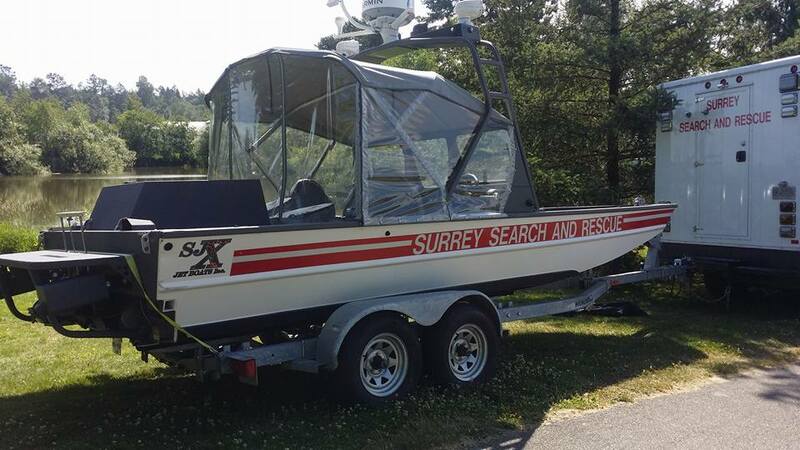 Our boats have been in operation within the Inland waters of the Fraser River and its adjoining lakes. The nature of water rescue is that we must train in the same hazardous environment in which we work – there is no such thing as completely safe marine environment! A high level of hazard, widely varied conditions, and perishable skills demand frequent training both for effective rescue and to keep our rescuers and subjects safe. The South Fraser water ways must always be respected, and should only be navigated by individuals with proper training with certified equipment.